Maybe you don’t have space in your small city apartment or maybe you have an aversion to cooking foods in a microwave. But there has to be more than one way you can cook a frozen breakfast burrito or entrée meal without a microwave. Don’t worry because we have you covered with these 3 ways to heat frozen food without a microwave, no matter what type of food you’re cooking. Say you’re browsing the frozen section and you came across some nutritious meals that you’d love to keep on hand for the days you really don’t feel like cooking or just don’t have the time. You know, those mornings when you didn’t get much sleep and have no energy to cook? A scramble bowl would be so helpful to have on hand. Or those evenings after a 10 hour work day that you just want to kick your feet up and watch Netflix while eating some buffalo style chicken pasta without doing any work. Plus it’s a more wallet-friendly option than most take out places you typically turn to. There’s just one thing stopping you from buying it, you don’t have a microwave. If you’re like most people, you have an oven built in to your kitchen. Overall microwaves and ovens may seem similar but they actually heat foods very differently. Conventional ovens heat food from the outside in while microwaves actually heat everything at once. The problem that comes with heating everything at once is that each ingredient heats very differently. Water and liquids heat quickly, while proteins and fats heat slowly. This can result in pockets of frozen meat while the sauce is burning (you know that popping sound that makes you think your food is burning but it’s still frozen solid). With a conventional oven your food will actually come out more evenly cooked. The downside that comes with cooking a frozen meal in an oven is that it takes a lot longer to heat the food. With a microwave, you can zap food and within three to five minutes it’s typically ready to be eaten. 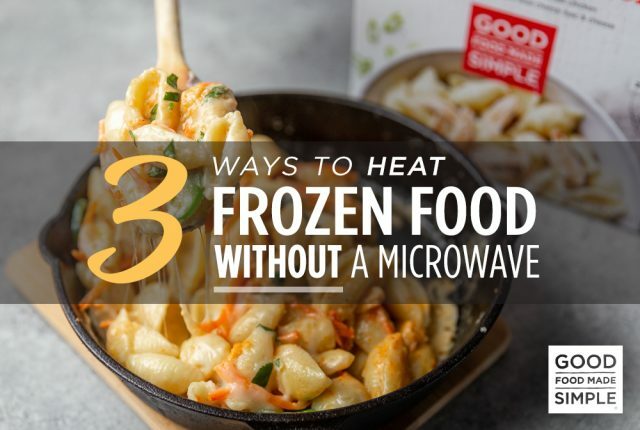 While cooking frozen food in an oven will take the longest amount of time to heat out of the following 3 ways to heat a frozen meal without a microwave. Which is important to note if you’re tight on time. It also has the potential to dry the food out because each oven is different, despite the settings, digital ovens are more accurate than turn knobs. So what kind of frozen frozen meals should you cook in the oven? Well to tell you the truth, pretty much all frozen meals can be cooked in the oven. This includes breakfast burritos, waffles, entree meals, pasta, burgers, or pot pies. Whatever your preference, the oven can cook it! Let’s say you want to have a frozen breakfast burrito before work, but need to get some things done before you head out the door. Preheat your oven to 350 degrees. Wrap the burrito in foil and place on a baking sheet. When the oven is up to temperature, bake the burrito for 45-50 minutes. 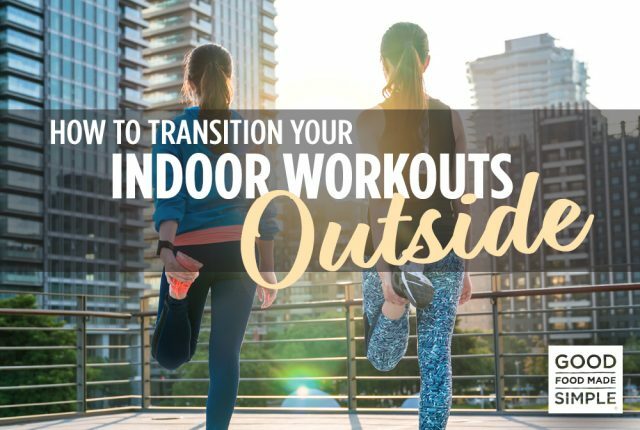 During this time feel free to take your morning shower, workout, get dressed, or feed the kids! Once you’ve finished your morning routine, the burrito will be melt-in-your-mouth ready. Or maybe you want to cook some of that delicious buffalo style chicken pasta mentioned earlier. Preheat the oven to 350 degrees. Remove the food from the packaging and put it in an oven-safe container. Cover the container with foil so the food doesn’t dry out. Once the oven is up to temperature, bake for about 30 minutes or until the bowl reaches an internal temperature of 170 degrees. You can then remove the foil, stir it, then place it back in the oven for 5 more minutes. By the time you’ve changed into your lounge clothes, poured yourself a glass of wine, and picked out a Netflix show to binge, your meal will be creamy and ready to eat. Surprisingly, a non-stick skillet can actually be a great go-to option to heat up a frozen meal. It takes slightly less time than an oven will yet requires more maintenance. Depending on what your cooking, a non-stick skillet will be your best option if you’re running slightly behind, but have time to keep an eye on your skillet. What should you cook in a non-stick skillet? 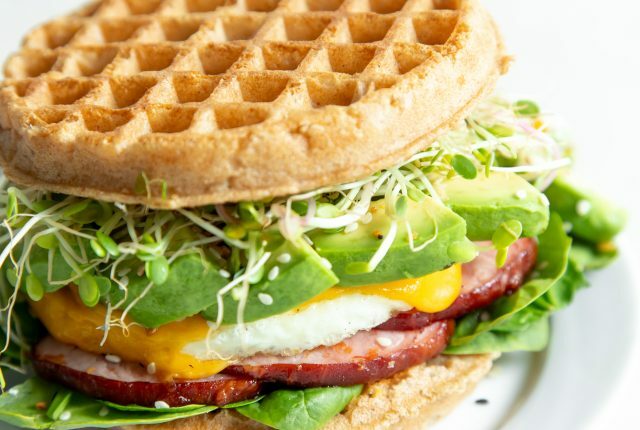 Foods such as burritos, pancake puffs, waffles, or egg white patties are your best answer. Heating a burrito requires no oil, takes about 10-15 minutes on a low temperature setting. Make sure you flip the burrito occasionally browning it on all sides. Once it’s heated thoroughly it will have a nice crispy outside with a soft, warm inside. You should always monitor your skillet to make sure that it is not too hot otherwise, it will quickly burn your food. Also good to note that you might want to add a drop of oil to the skillet if you feel that the meal is getting a little dry. Most frozen meals cooked on a skillet will require monitoring and a little bit of testing to really get it right if the packaging doesn’t mention a way to cook the meal with a skillet. Another way to heat a frozen meal without a microwave is in a saucepan. We recommend heating frozen food such as oatmeal, scramble bowls, or even some entrée bowls in a saucepan. Make sure to keep the temperature on low so as to not burn the food. Remember the food is already cooked, we’re just looking to reheat it. The key is to keep a close eye on your food and keep stirring so the food is heated evenly. Feel free to add a tiny bit of water if you think your food might be getting dried out. After about 10-15 minutes your food should be heated through, but we always take a test bite to double check. So don’t fret if you purchased food that doesn’t have alternative heating instructions on it, you should be able to heat it up with one of these 3 ways to heat a frozen meal without a microwave. It might take some trial and error to get the food heated exactly right, but consider it a challenge! Nutritious frozen meals are great to have on hand for any time you don’t feel like cooking or don’t have the time to prep all the ingredients. So, don’t be afraid to browse that frozen aisle with confidence next time even though you don’t own a microwave.